Brooklyn, NY CAMBA Housing Ventures (CHV) and CAMBA, along with city and state leaders, joined residents to celebrate the grand opening of 603 Mother Gaston Blvd. Located in the Brownsville section, this is a $56 million, 101-unit LEED Gold sustainable, affordable, and supportive housing development. Government partners included the New York City Housing Authority (NYCHA), New York City Housing Development Corporation (HDC), the New York City Department of Housing Preservation and Development (HPD) and New York State Homes and Community Renewal (HCR). Dattner Architects is the architect. 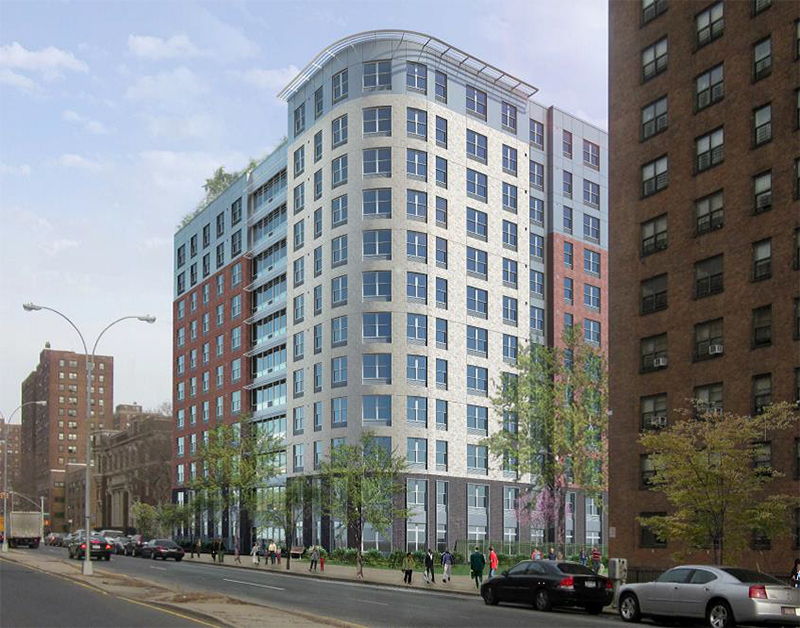 The first new construction development at NYCHA’s Van Dyke Houses in decades, 603 Mother Gaston Blvd. transforms an underutilized parking lot as part of NYC’s plan to develop affordable and supportive housing for low income and formerly homeless New Yorkers. It is also part of a comprehensive neighborhood reinvestment strategy for Brownsville, providing key economic impacts. The development demonstrates the numerous benefits for communities when partnerships are forged amongst a public housing authority, non-profit developer, social service provider, public funding agencies, and private investment. “Affordability combined with supportive services is a powerful force in combatting homelessness and strengthening our economy. We are proud to join our partners in helping to deliver those forces to Brownsville with 603 Mother Gaston Blvd,” said HCR commissioner RuthAnne Visnauskas. 603 Mother Gaston Blvd. consists of 101 apartments (44 one-bedrooms, 57 two-bedrooms, and a two-bedroom unit for the superintendent) available to households making no more than 60% of the area median income with 30 units set aside for formerly homeless families and 45 units set aside for those on the NYCHA site-based waitlist. 603 Mother Gaston Blvd. responds to the need for supportive and affordable housing and has created lasting economic impacts for the community. This includes streamlining access to housing for those on housing authority waitlists, increasing the housing stock available to serve low-income and formerly homeless families. It is also designed to facilitate the stability and health of all tenants and provide housing with on-site services, a proven, cost-effective way to reduce homelessness and costs to the City of New York (such as emergency room visits and shelter costs). Additionally, the development has brought much-needed public/private investment to the community, including 71 construction jobs for Brooklyn residents, 8 of which are dedicated to residents of CB16. In addition, the development will result in the creation of 10 permanent jobs, nearly $9 million in investments in local Brooklyn businesses, and $1.5 million in contracts to MWBE businesses. Beginning in 2015, CHV committed to a goal of 25 CAMBA hires for NYCHA residents over 5 years and has already surpassed that goal with 113 hires to date. NYC council member Alika Ampry-Samuel said, “This is one of the smartest projects I have had the opportunity to partake in as it strategically combines and holistically offers 101 units of safe, state of the art affordable housing with comprehensive services in the heart of Brownsville. This is a $56 million investment that will provide families with the opportunity to flourish and thrive. At a time when real estate properties and rents are at an all-time high and properties intentionally price people out, CAMBA has taken a step to ensure our constituents can remain in this community. CHV is focused on design excellence, sustainability and innovative partnerships to provide affordable housing, engaging common spaces, and unique features that are amenities for the tenants and the Brownsville community. Amenities at 603 Mother Gaston Blvd. include 24/7 front desk security, a computer training center available to all residents, an on-site laundry room, two flexible community rooms for larger group activities and community meetings, a roof terrace, outdoor green space, community art, and Zimbabwean Shona Sculpture. CAMBA provides on-site social services, including financial literacy, healthcare access, employment services, education/job training, and family services, as well as referrals to its 160 programs and services across New York City. Designed and built to achieve New York State Energy Research and Development Authority (NYSERDA), Enterprise Green Communities, and LEED Gold standards, 603 Mother Gaston Blvd. features Energy Star appliances and lighting to reduce utility costs; healthy indoor air quality; high-efficiency building systems; low/non-toxic finishes; bike parking on site; high efficiency flow showers, sinks, and toilets for water conservation; and day-lit common areas and energy-efficient windows. This reflects CHV’s strong commitment to innovation in sustainability and design. “The RBC Tax Credit Equity Group is very proud to be a part of the team that brought 101 units of much needed family housing to Brooklyn. We thank the very talented staff at CAMBA Housing Ventures, as well as our investor, Bank of New York Mellon, and all of the men and women at the New York City and State agencies who worked so hard to make this happen,” said Thomas Maxwell, regional director, RBC Capital Markets. The project was financed through $56 million in public and private investment. HDC provided more than $28.5 million in tax-exempt bonds and $4.95 million in corporate reserves, and HPD provided approximately $7.6 million in City subsidy. In addition, the project benefits from valuable low-income housing tax credits (LIHTC) that generated more than $24.59 million in tax credit equity. The Homeless Housing Assistance Corp. (HHAC) provided $6 million. HCR provided $2 million through its Homes for Working Families Program. JP Morgan Chase provided the letter of credit and RBC Capital Markers was the tax credit syndicator, with Bank of New York Mellon as the tax credit investor. Corporation for Supportive Housing provided pre-development financing and NYC Department of Health and Mental Hygiene provides funding for CAMBA’s on-site social services.